Friendship Day is the time to appreciate and pay a tribute to that wonderful person called the friend without whom we can never make do with this world. Great men and women all over the world have, from time to time, understood the importance of having friends and the power of the beautiful relation called friendship. And so they have praised their own friends; pondered over the greatness of friendship and commented on what goes on to make an ideal friend in glorious verses and pithy sayings. Here we bring to you a handful of quotes from some of their most memorable sayings on friends and friendship. Scroll down and go over our grand collection of Friendship Day quotes that range from the funny to the reflective. 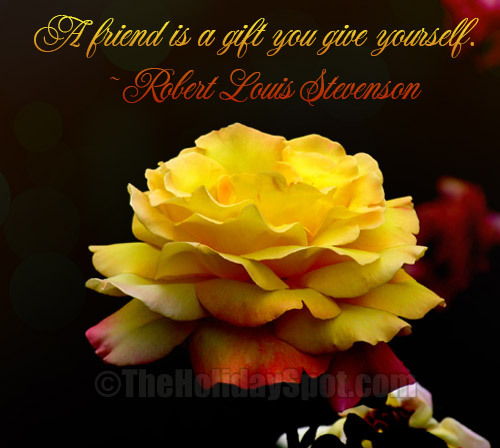 You can also use these quotes about friends and friendship in your cards, gifts and crafts for Friendship Day! 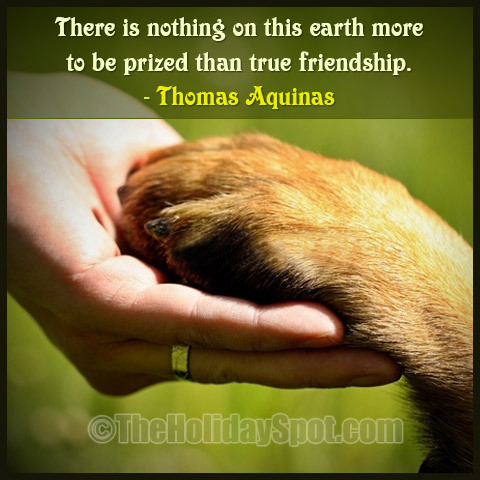 Imbibe the spirit of Friendship Day with these thoughtful Friendship Day quotes. Happy Friendship Day to you and all your friends! In every veil you see, the Divine Beauty is concealed, making every heart a slave to him. In love to him the heart finds its life; in desire for him the soul finds its happiness. The heart which loves a fair one here, though it knows it not, is really his lover." "To display his eternal attributes in their inexhaustible variety, the Lord made the green fields of time and space. " "The pain we feel when someone leaves our life is in direct proportion to the joy they bring while a part of our life for a few moments. In my life you made me feel as if I truly meant something to someone"
"Books like friends should be few and well-chosen." "A friend you have to buy won't be worth what you pay for him." "The sacrifices of friendship were beautiful in her eyes as long as she was not asked to make them." "The difficulty is not that great to die for a friend, the hard part is finding a friend worth dying for." "In the New Year, may your right hand always be stretched out in friendship, but never in want?" "I notice my wife when she's on the phone with her friends, man they will share every animate details of their lives with each other. See men once we become friends with another man we may never say another word to him, unless there's valuable information that needs to be exchanged. Things like " "Hey Jim, your shirt's on fire." "Show me a friend in need and I'll show you a pest." Epicurus was also famous for the care with which he cultivated friendships, to which echoes his Roman follower, Lucretius: "It is not so much our friends' help that helps us, as the confidence of their help." "Friendships are what our dreams are made of. We hold onto each other with its binding love. We stand close to each other, hand in hand, showing each other we understand. Some friends may come and go, but you are the truest friend I know." 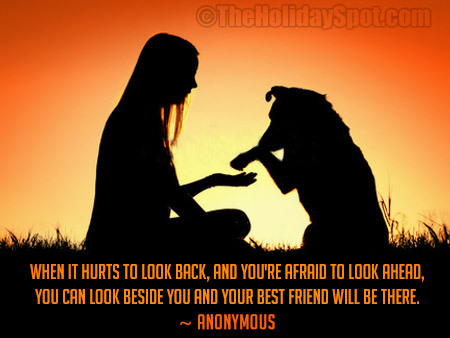 "When it hurts to look back, and you're scared to look ahead. you can look beside you and your friend will be there." "A Friend is a treasure. More precious than Gold, For love shared is priceless And never grows old." Friendship is like a mark on a stone.. "which can never be erased".. But when someone tries to rub a stone and erase it. The fire produced can burn anyone. Real friends understand when you say you can't, forgive when you say "sorry", feel happy when you say you miss them, smile when you say you care for them, but die when you say forget me.